Which slumping auto stock is the better bet now? 2018 was a rough year for auto stocks: New-car sales have slowed in China and might be slowing in the U.S., pricing pressures are rising in Europe, and trade-war concerns threaten to throw wrenches into many automakers' plans. When a whole industry falls out of favor, as autos have over the last year, there are often opportunities for investors. But which automakers are the best bets for new money now, with a potential slowdown on the horizon? Below, I'll look at two high-performing global auto giants, Toyota (NYSE:TM) and General Motors (NYSE:GM). Which is the better bet today? Read on. CEO Mary Barra's goal is to make GM the most profitable automaker in the world. Image source: General Motors. 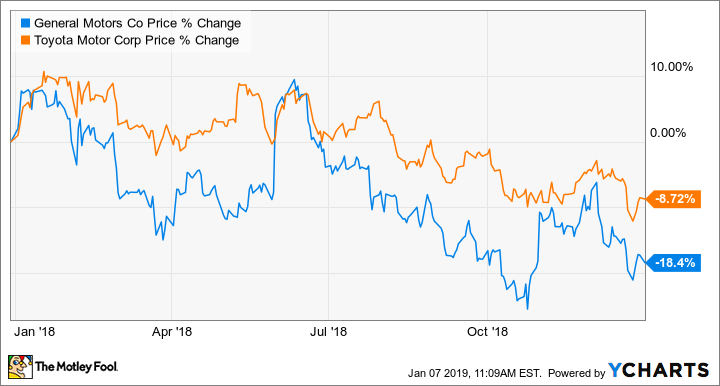 Neither Toyota nor GM had a great 2018 in the stock market. But while Toyota's U.S.-traded shares fell almost 9%, GM's fared much worse, dropping just over 18% on the year. Looking ahead, Wall Street analysts polled by Thomson Reuters expect both companies' earnings to decline next year, which makes both stocks look a bit more expensive. The analysts currently expect Toyota to earn 835.49 yen per share, on average, in the fiscal year that will end on March 31, 2020, giving us a forward price-to-earnings ratio of about 7.8. They expect GM to earn $5.86 per share in 2019, for a forward price-to-earnings ratio of about 5.9. Toyota pays dividends twice a year. In its most recent fiscal year, which ended on March 31, 2018, it paid total dividends of 220 yen per share, an increase from 210 yen per share in the two fiscal years prior. It translates to a dividend yield of about 3.4%. General Motors pays a quarterly dividend, currently $0.38 per share or $1.52 per year. It was last increased in February of 2016, and GM has signaled that it's unlikely to be increased again in the near future. At current prices, GM's dividend yield is about 4.4%. Huge demand for Toyota's compact RAV4 crossover has helped offset slumping sedan sales. Image source: Toyota. How long would it take GM to exhaust its cash in a downturn? In 2017, GM modeled a typical moderate recession and concluded that it would use about $5 billion from its reserve in the first year of the downturn. For context, over the last 45 years, peak-to-trough economic contractions in the U.S. have lasted an average of 12 months. Long story short: GM's dividend probably isn't at risk unless we enter a severe and protracted recession -- but a dividend increase may not happen for a while. Both GM and Toyota have plans to increase profitability over the next several years. Toyota's is incremental: Like GM and other rivals, including giant Volkswagen, Toyota is in the process of moving most of its vehicles to a shared, modular architecture that will greatly improve economies of scale while simplifying manufacturing. CEO Akio Toyoda has also been carrying out an extensive cost-reduction effort that has already yielded significant gains. CEO Akio Toyoda has cut costs while pushing Toyota to create more emotional products. Image source: Toyota. GM is doing something similar with its vehicle architectures, though it's a few years behind Toyota. But CEO Mary Barra has more plans in the works: The company recently announced a major restructuring of its North American operations that is expected to boost GM's automotive free cash flow by $6 billion a year by the end of 2020. GM will give more specifics on its plan later this week, but we already know that the company will use that added cash flow to ensure that it can keep its electric-vehicle and self-driving efforts fully funded through a downturn. GM subsidiary Cruise Automation is aiming to launch a fleet of self-driving taxis in U.S. cities later this year. GM's restructuring is intended to ensure that Cruise and other future-tech efforts remain funded. Image source: General Motors. With respect to risk, neither company is likely to be in danger of collapse any time soon. Both are major employers in their home countries, and both would likely benefit from government support (as GM did in 2009) if something like another economic crisis put them in danger -- though to be clear, that's not likely: GM is in far better shape than it was in 2009, and Toyota has massive cash reserves available. But in the near term, it's important for investors to keep in mind that all automakers are cyclical companies, meaning that their sales and profits rise and fall with consumer confidence. Specifically, both companies will see profits decline sharply whenever the next recession arrives -- but they'll rise again as the economy recovers. Toyota is the conservative choice: It has a strong credit rating, a fat cash reserve, and a decent dividend yield. It's unlikely to drop too far in a protracted bear market, but it's also unlikely to soar in a recovery. GM is far healthier than it was in 2009 (and arguably the healthiest of the three Detroit automakers). It's likely to drop more sharply than Toyota in a recession -- but also likely to pop nicely early in the recovery. And you can reinvest that nice 4.4% dividend to dollar-cost average through that swing down, whenever it happens. There's another reason to like GM right now: Its self-driving subsidiary Cruise Automation could be headed for a spinoff at some point, an event that could unlock significant value. Taken all together, I think GM is the better buy for new money today.